Dante’s Divine Comedy has, since it was first published, captured the imagination of readers with its amazing journey through hell, purgatory, and heaven. Now, in a dazzling reimagining of Dante’s work, award-winning novelist and poet Philip Lee Williams presents his own version of our journey from suffering to final rest. 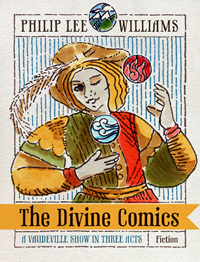 The Divine Comics: A Vaudeville Show in Three Acts is Williams’s stunning updating of Dante’s original epic poem, though as fiction this time, filled with wild surrealist riffs, postmodern side trips, and multiple layers of meaning, plot, and character. Some twenty-eight years in the making, The Divine Comics is a landmark book, at once an acidic romp and a deep and richly imagined investigation into intersections of the mind and heart. Set in three sections, “Fire,” “Earth,” and “Air,” Williams’s book recalculates and updates the nexus of human history with prose that ranges from laugh-out-loud farce to deeply moving and poetic fiction. “Fire” follows the bizarre goings-on at a music conservatory in the mountains of North Carolina, while “Earth” is the strange journey of a Florida woman who decides she wants to be a queen, and “Air” the machinations of a group of highly accomplished “fellowship” winners at a palatial estate in the Colorado Rockies. In the end, all three stories thread together in a tour de force of raucous and wickedly on-target scenes that take dead aim at the foibles of being human. The Divine Comics is like nothing else that has been published in American letters, and, despite its great length, is a compulsively readable book whose main goal is to entertain—though, like The Divine Comedy, its built-in enlightenment shines like a brilliant torch on the path we all must walk.